SingTel Presents Formula 1 Singapore Style! Formula 1 Season is back for the 6th edition in Singapore! 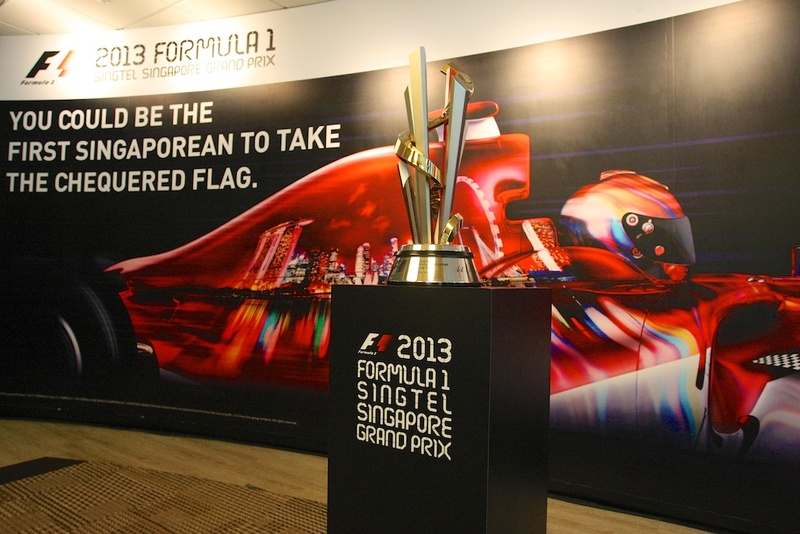 The 2013 Formula 1 SingTel Singapore Grand Prix (GP) will be held from 20th to 22nd September 2013 at the Marina Bay Street Circuit and there are many exciting activities and events leading up to the Singapore GP in the month ahead! At the media launch this morning on the 20th August 2013, we had an overview of the events and activities for this year’s 2013 Singapore GP, with a unique and distinctive local Singaporean flavour. The 2013 Singapore GP will bring the race experience even closer to the hearts and souls of Singaporeans with Formula 1 Singapore Style! An island-wide search for Singapore’s fastest race driver begins today in The Big Race. Local celebrities and self-proclaimed Formula 1® fans, Joanne Peh, Qi Yuwu, Pei Fen and Romeo Tan, will take their marks to clock their fastest lap times in the Official F1® racing game. The search for the best race drivers in Singapore will follow at a series of four roadshows where the public is invited to try their hand at the game. The fastest racer from each roadshow will team up with a celebrity racer in an ultimate race finale and the winner will be announced on 22 September 2013 to win an once-in-a-lifetime F1® driving experience in Europe. This exciting showdown will be seen at key locations around Singapore. Eight fresh-faced ladies aged 18 to 26, have been chosen as this year’s SingTel Grid Girl finalists. Since the inaugural Singapore Grand Prix in 2008, the SingTel Grid Girls have been a star attraction of the race, vying for top honour and a once-in-a-lifetime chance to hold the Singapore Formula One® and Singapore GP flags at the Singapore Grand Prix. This year, the public can choose their favourite via SMS and online voting to select the top three SingTel Grid Girls. The Singapore Factor, a series of webisodes hosted by Paul Foster, will put the girls’ knowledge of the Lion City to the test in a trio of uniquely Singaporean challenges. Fans can follow the journey at www.singtelrace.com from 21 August 2013. The top three SingTel Grid Girls will be crowned before thousands of Singaporeans at the Thursday Pit Lane Experience on 19 September 2013. As a symbol of unity enabling everyone in Singapore to show their support, a limited-edition version of the famous chequered flag featuring a red square has been created to bring forth the uniqueness of the Singapore Grand Prix. From August 21 until September 15, a digital version of this Formula 1® Singapore Style flag will be hosted on www.singtelrace.com/wavetheflag for all to have a go at virtually “waving” the flag on their smartphones. Fans that “wave” the digital flag stand a chance to win daily prizes. During race weekend, 60,000 souvenir flags will be distributed at the circuit on 22 September 2013 on a first-come-first-serve basis. You can take part in this year’s SingTel Singapore GP activities, “The Big Race” Challenge, Wave the Flag, Singapore and Vote for the top three SingTel Grid Girls, do visit www.singtelrace.com for more information! This year’s Formula 1 SingTel Singapore GP has our local Singapore designers taking centre stage with collaboration between SingTel and PARCO next NEXT. Samuel Wong from local menswear label, Evenodd, designed and gave this year’s SingTel Grid Girls uniforms a new and refreshing look! 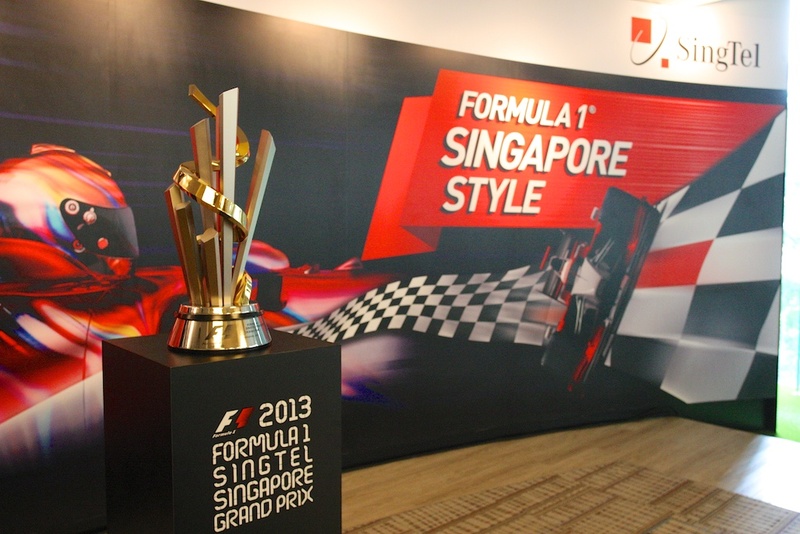 During the 2013 Formula 1 SingTel Singapore GP media launch, we witnessed the unveiling of the winner’s trophy designed by local jewellery and gift designer, Risis. This is our first Singapore GP trophy to be designed by a homegrown company and the trophy design was inspired by the iconic Singapore skyline and is accentuated with signature gold swirls to represent the Singapore racetrack from an aerial view! This will probably be the only chance I can get up close and personal to the F1 winner’s trophy and I took the opportunity to have a photograph taken beside this year’s 2013 winner’s trophy! A fun and exciting Formula 1 SingTel Singapore GP 2013 is coming soon, with the entertainment and concert performances line up, along with the Formula 1 Singapore Style activities and events! For a sports photographer and avid F1 fan, I am looking forward to capturing my favourite F1 sports car drivers in action, Alonso and Kimi driving and pushing their F1 cars to the limits! Here are some useful links to gather more information and gather updates on Singapore GP! Folks, start your engines and get ready for high octane Formula 1 racing action from 20th to 22nd September 2013 at the Singapore GP!